I displayed this photograph at an exhibit whose theme was “a moment in time.” I was discussing this image with an attendee, and I mentioned that I happened to be at the right spot at the right time to capture the mist and sunlight. That was a poor choice of words, because it implied that it was a lucky shot. “Don’t you think that most good photographs are mostly a matter of luck?” she asked. I quickly said no. 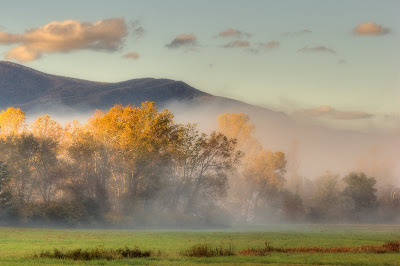 I had been shooting in this area of Cades Cove for several years, and I knew that if I arrived at that spot in the early morning just as the sun was rising, I stood a good chance of catching the sunlight scraping across the landscape, interplaying with the fog and trees. This photograph was the result of knowledge accumulated over five years. And it required waking up early, driving to Cades Cove in the dark, waiting in line for the park gate to open, going out to my spot, setting up my camera and tripod, and knowing what lens and camera settings to use. When the magic moment occurred, I was ready. Canon 20D HDR Image from three exposures Photomatix Pro f/8 ISO 100 28-200mm lens @80mm To see a larger version of this photograph, click here.